The Lesser Horseshoe Bat is an endangered species, and it is seen very rarely in southern England and Wales. It is also found in Ireland. 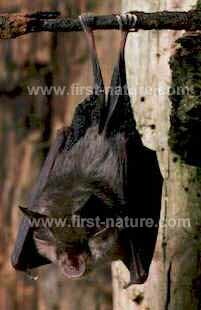 At 3.5 to 4.4 cm body length, it is a much smaller animal that its relative the Greater Horseshoe Bat, and it weighs typically just 5 to 9gm - not much more than a Pippistrelle. This tiny bat has the characteristic horseshoe-shaped plate of skin around its nostrils. 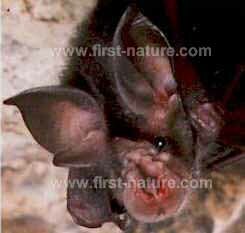 Despite its small size, the Lesser Horseshoe Bat preys on relatively large insects: moths, craneflies and sedge flies. These it generally eats on a night-time perch, beneath which the wing remains of insects are to be found. This little bat seems particularly fond of unimproved grassland areas beside water. Roofs of barns, stables and rural houses are the preferred summer roosting places of the lesser horseshoe bat, and particularly where there is an opening large enough that they can fly directly in and out. Maternity colonies of 30 to 70 are normal, but exceptionally they form colonies as large as 200 bats. Lesser Horseshoe Bats hibernate, sometimes in large groups, from October until late April or early May. Their winter roosts are most often in caves or tunnels, where they hang by their feet, often in open and exposed positions but rarely in large clusters. Fascinated by bats? You are in for a real (unreal!) treat when you read Frazzle, by Pat O'Reilly. This outrageously hillarious novel has been compared to the mosdt imaginative works of Terry Pratchet and Douglas Adams.